Swan Podiatry and Orthotics is a deliberately small private podiatry clinic established to provide personal and professional foot care to the residents of Darwin, NT. 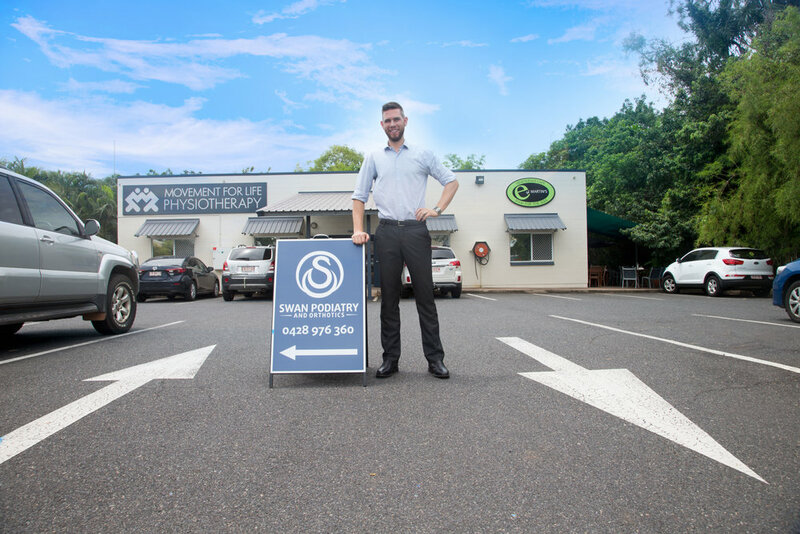 Conveniently located within Movement for Life Physiotherapy in Coconut Grove, Swan Podiatry and Orthotics strives to allow people to live a happy, healthy and active lifestyle. + WHAT IS A PODIATRIST? Many people are unaware of what a podiatrist actually is and what services they can provide. A podiatrist is an Allied Health Professional who specialises in the medical care, diagnosis and treatment of the foot, ankle and lower limb. No referral is required to see a private podiatrist; however, a doctor may refer directly if needed. Podiatrists can treat children’s foot pain, assess people with diabetes, investigate abnormal foot mechanics, and manage skin and nail conditions including ingrown toenail surgery. It is all too common for people to put up with foot pain and delay visiting a podiatrist as they think the pain is ‘normal’. A visit to a podiatry clinic is required if any pain or discomfort is present in the feet or legs. Pain is not normal and there are range of podiatry services available for use to improve symptoms. Common problems include heel and arch pain, shin splints, sprained ankles, flat feet, bunions, knee discomfort and Achilles pain. Treatment options available can include various strappings, foot mobilisation and custom orthotics. The appointment will take place in the podiatry clinic and will involve a discussion to get a thorough history to understand what may be the cause of the problem. Assessments of the feet and legs whilst standing, moving and in the clinic chair are performed to find out the underlying cause of the issue and make a management plan. Further test may be needed, such as a referral for x-ray or ultrasound, to determine the exact cause of symptoms. Please bring in the footwear that you wear the most (eg. for work or sport) along with any previous orthotics. On-the-spot claiming with private health insurance is available if the cover includes appropriate podiatry extras, which means you only have to pay the remaining gap. If you are referred by a doctor, please bring either Medicare or DVA card as this may be required. Our podiatrist in Darwin, NT, is conveniently located for those throughout the areas of Katherine, Nightcliff, Coolalinga and surrounds.